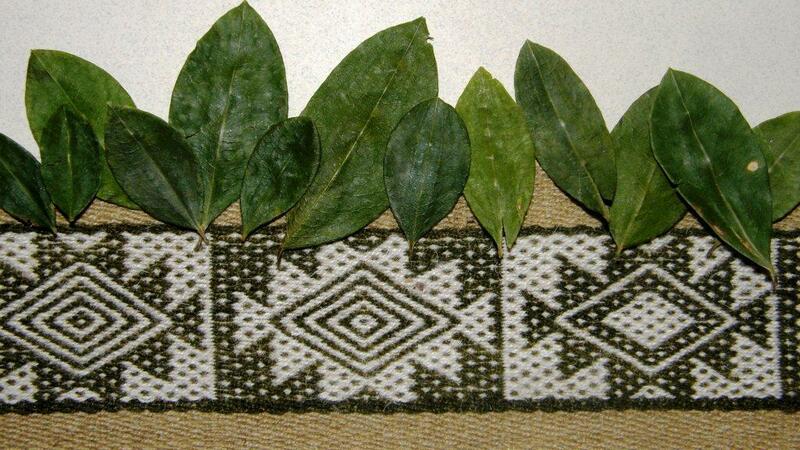 The coca leaf – I have enjoyed it brewed in tea, chewed it on hiking trips and used it to dye my handspun llama fiber above. However, a foreigner like myself can not even begin to understand the role that this humble leaf plays in Bolivian life and culture. Lately there has been a lot more talk than usual about this piece of Bolivian cultural heritage as Bolivian President Evo Morales has recently announced plans to launch a new carbonated energy drink on the market which has the beloved coca leaf as one of its main ingredients. It should make an appearance in the next four months and will be called “Coca Colla” (the ‘olla’ in Colla being pronounced like the ‘oy’ in boy). 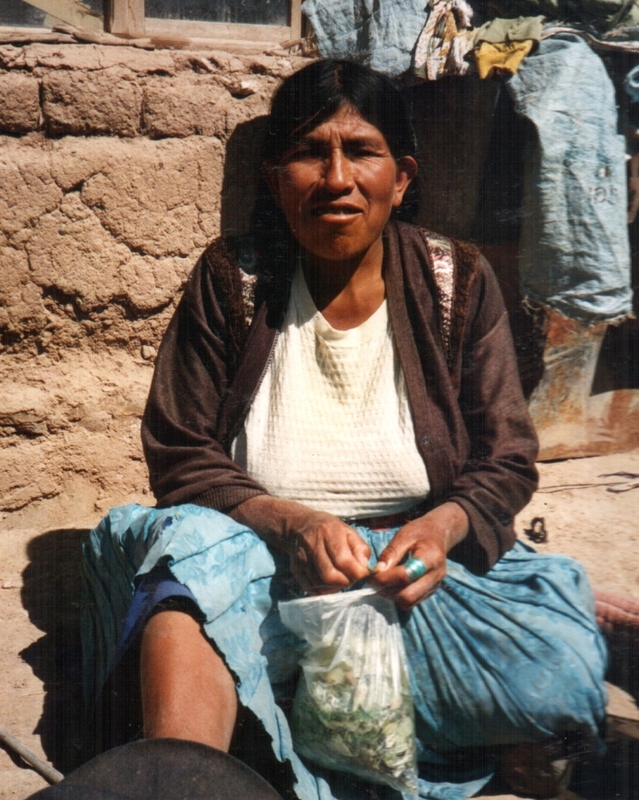 “Colla” is the word commonly used to describe people from the altiplano of indigenous origins. This is President Morales’s attempt to erradicate coca’s unfortunate association with cocaine and drug trafficking, increase its cultivation and have it recognized instead, as stated in the new Constitution, as “cultural heritage, a natural and renewable resource of biodiversity in Bolivia and a factor of social cohesion”. Coca is used to make tea, plays a part in religious rituals and is chewed in order to suppress hunger, thirst and fatigue as well as to alleviate the symptoms of altitude sickness. I have chewed it myself on hiking trips and I have to tell you that there is knack to getting a wad of it tucked neatly away in your cheek and not all over your teeth thus completely ruining your smile for the day! 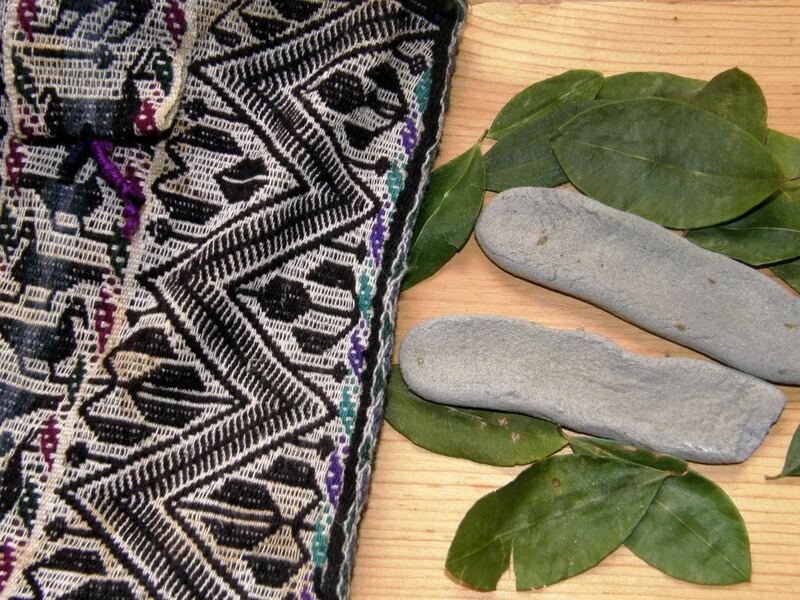 Bags of coca leaves are sold with lejia-the gray colored bar seen at left, comprising compressed ash and other substances, which is chewed along with the leaves and acts as a catalyst. 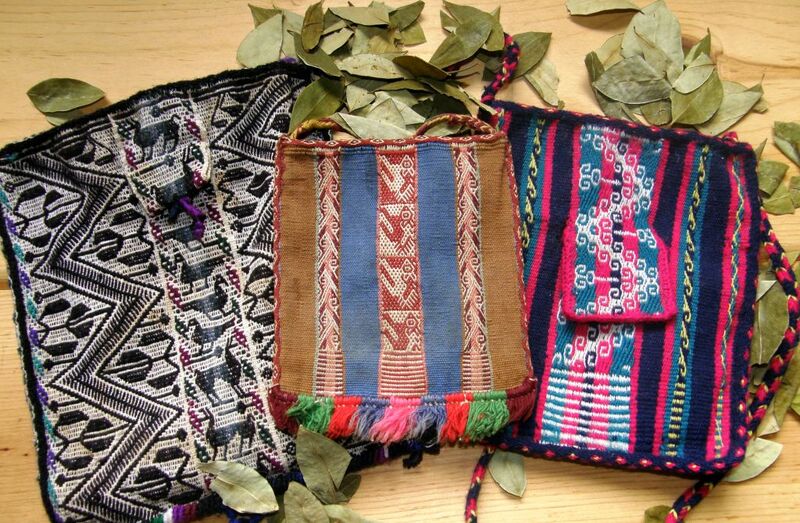 A special woven bag called a chuspa is used to carry coca leaves but I have only seen these in use at festivals and other celebrations. On a normal day, it is more usual to see people taking their coca leaves directly from a regular plastic bag. My weaving teacher, Julia, at right, is taking a break from classes to enjoy some coca. While Julia and her sister Hilda both know how to weave a chuspa, strangely neither of them actually owns one. When I expressed interest in learning to weave one, they had to consult with each other in order to remember how to wind the warp. What is special about warping for a chuspa is the fact that most chuspas include a small pocket which is designed to carry a piece of the lejia or perhaps a few coins and allowance must be made for this in the length of the warp. 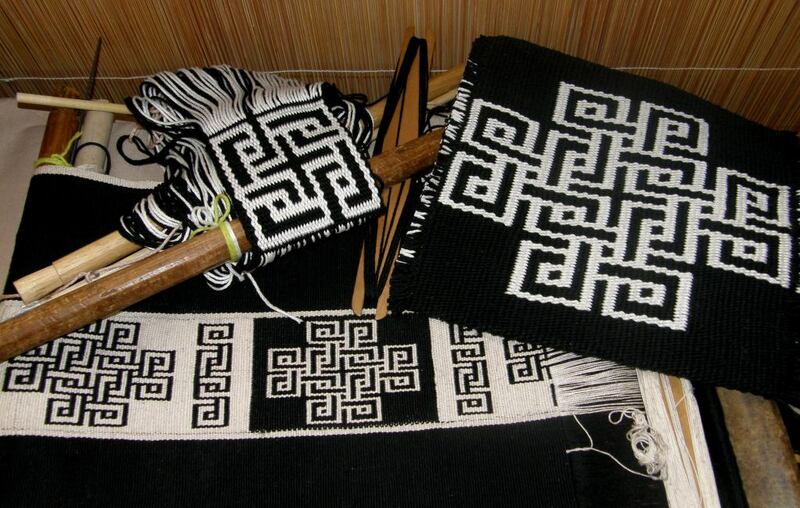 Three Bolivian chuspas, each woven with a different complementary warp technique. 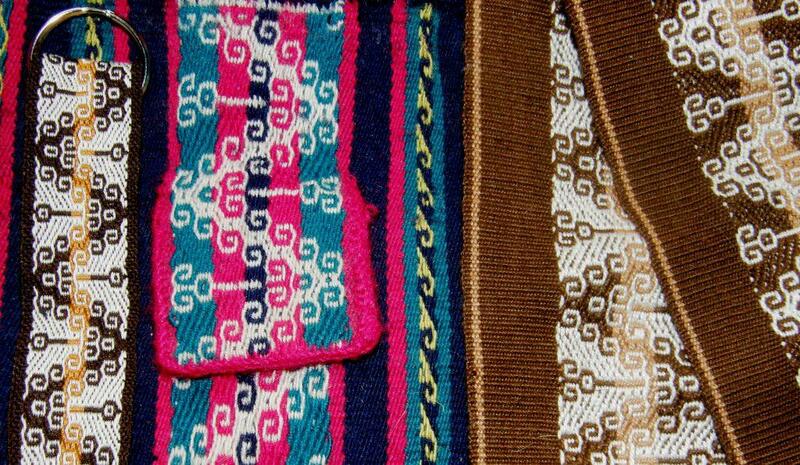 The one on the left was made by my weaving teacher in Candelaria and has a pocket. While the one in the middle was bought in Potosi, I am not sure of its exact origin. It does not have a pocket. The one on the right with a pocket is the one I made in Potosi under Julia and Hilda's instruction. Julia and Hilda are preparing the warp for my chuspa. You can see the extended piece of warp on an extra stake which will become the pocket. We are using the brightly colored respun acrylic yarns that are very popular in this area. We are all at work here. I am working on my chuspa, Hilda is backstrap weaving a band while Julia, in the background, is cutting fleece to spin. My chuspa is a four-selvedge piece so I wove from one end, turned the piece around and wove from the other end and then had the usual agony of trying to squeeze weft into those last few rows to close the gap. Hilda taught me to weave the ''rolling river''design into my chuspa. 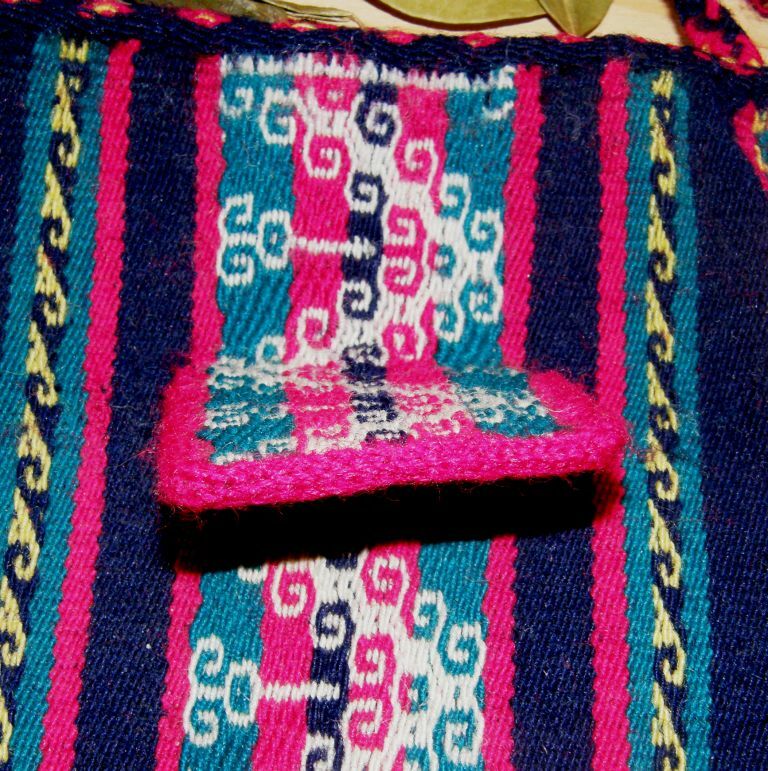 Once off the loom, the sides and pocket are joined using a variety of decorative techniques.We used triple crossed knit looping to edge and sew the sides of the pocket. This is a very pretty technique that not only binds the sides but also completely curls over and covers the edges. You may be able to see the crossed knit looping more closely here on the edge of another bag that I wove. The brown sample shows how it would look worked flat rather than curled over an edge. 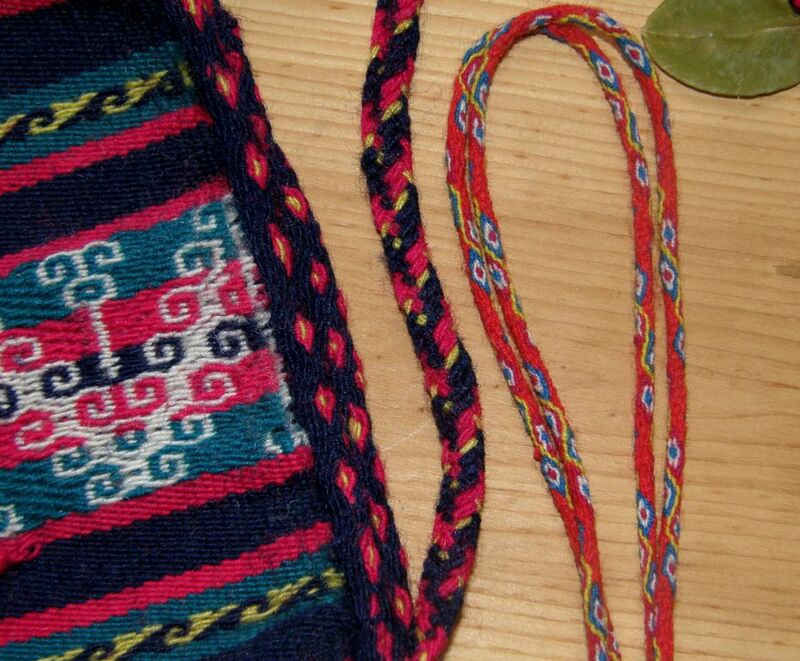 A tubular band was woven with the weft being used to sew it to the sides and base of the bag as it was woven. A six-strand flat braid was made for the bag strap. The chuspas that I have seen being used in festivals are highly embellished with pom poms, tassels and multi colored fringes. The ''rolling river'' design has since become a great favorite of mine and I have woven it into tool bags, sashes and key fobs on my backstrap loom. 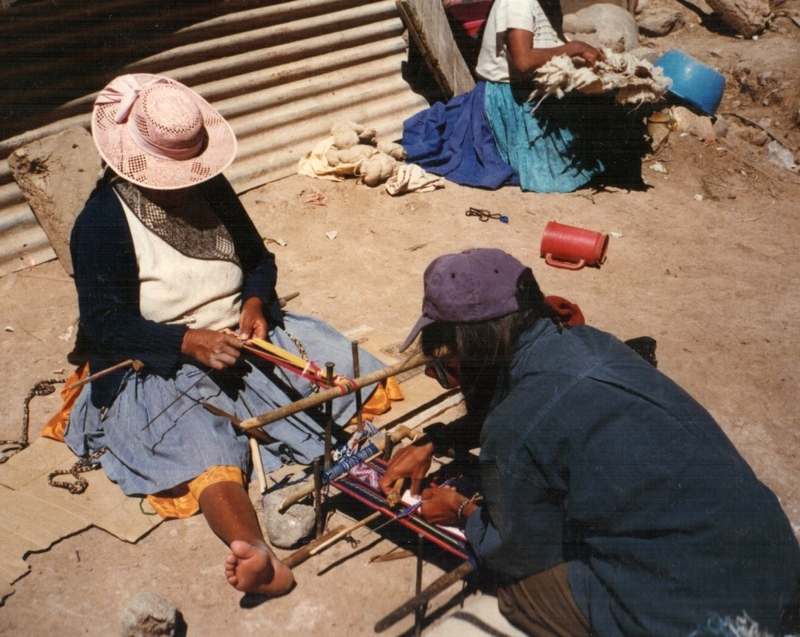 In 1998, I spent some time with a weaver in the village of Candelaria near Tarabuco and learned the weaving technique that is used in their chuspas and carrying cloths. A Tarabuco style chuspa made by my teacher Felicia . The pocket is so small it is hard to see it being of any real use. 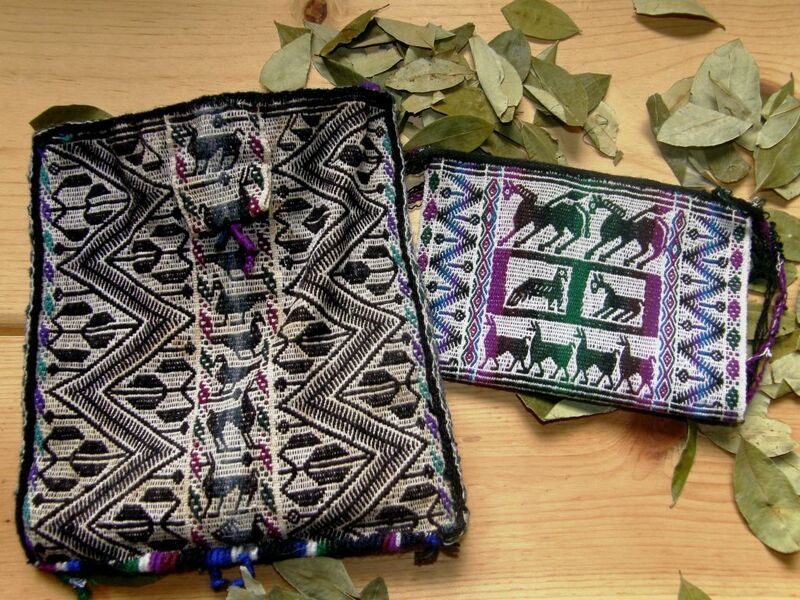 The other piece is a small purse which has been woven specifically to be sold to tourists. Note the cute strolling llamas along the bottom. I returned to Candelaria last year. Felicia is no longer there but the first person I met as I entered the village was Felicia’s cousin-also called Felicia! who took me to her home and graciously allowed me to film her weaving on her oblique loom. The next day I went to the market in Tarabuco where there was a cultural festival and was able to capture a small piece of video of a weaver warping for a chuspa. She was constantly being interrupted by ladies asking her questions so the clip is very short. I don’t know how well that warp could have turned out with all those pauses. When I warp, no one can speak to me! So here is the short video (yippy! I have finally figured a way to get around my erratic internet service and upload heavier videos). 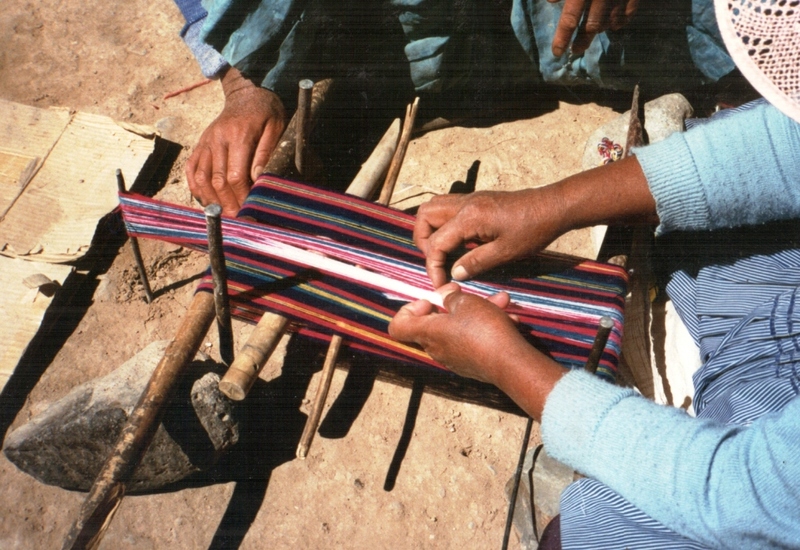 The first part is the weaver warping for a chuspa with two colors around four stakes. You will see the extra stick she uses on which to warp the extra long part for the pocket. The second piece is Felicia-keep an eye out for the kitty snuggled in her lap while she picks up those warps with lightning speed! I have been working away on my Abba Yohanni inspired piece and have decided that I am going to make a table set to take as a gift on my next visit to Australia. So, the piece you saw last week will be a table runner. I have made some progress on that and have reversed the design and am just starting the final motif. In the meantime I couldn’t resist seeing how the motif would turn out in 12wpi cotton and so wove it into a (rather large) hot pad using one-weft double weave technique and then wove a small portion of the motif into a mug rug. I am thinking about weaving four placemats to go with the set with a piece of the motif woven with a supplementary weft in the center of each. And finally…..here are two videos on one-weft double weave technique on the backstrap loom. You will recognize my Mexican mug rug there. These video clips are not meant to teach you the technique but will act as a supplement to the detailed instructions and photos in the Backstrap Weaving Group at Weavolution. With these videos you will see those “static” instructions in action. For those who have followed my instructions at Weavolution, you will notice a small change in the way I use the sticks which you may like to try. 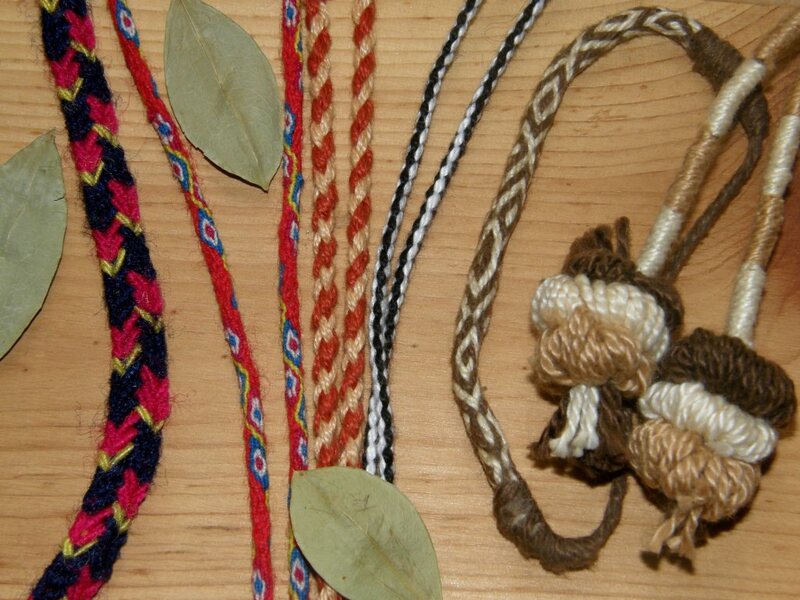 « Backstrap Weaving- A Word or Two and a Video on Warping. ¡Hola! Soy Luchita en ravelry y Luchi en weavolution. Estuve mirando tu tutorial en weavolution, me encantó, aunque no lo encontré en español. Nunca dejo de sorprenderme por tus trabajos, son fabulosos. Desearia saber mejor el inglés para poder sacar más provecho de todo lo que contás. ¡Maravillosos videos! Gracias por compartirlos. Aqui esta el link para las instrucciones en espanol en Weavolution……. your videos are wonderful! (they all played just fine!) and I like the way you use the sticks. It is good to see the amount of effort you put into swiching sheds and dealing with threads that are a little bit sticky. (it lets me know my warp is not out of line!) You have been very, very bussy weaving. What great bags (and the braids & bands too); I am thinking they might make great project bags for knitting or spindle spinning. I might put a piece of chocolate in the little pocket! I love the look of that knit edging and have added it to my mental list of techniques to learn. Thanks Cindy. Chocolate in the pocket-it almost rhymes! That knit edging is so cool. I think I’ll do a tutorial in the backstrap group for that. The most fun part is decorating the bag and you don’t have to do it as a 4 selvedge piece. Hi Laverne! These are so lovely! 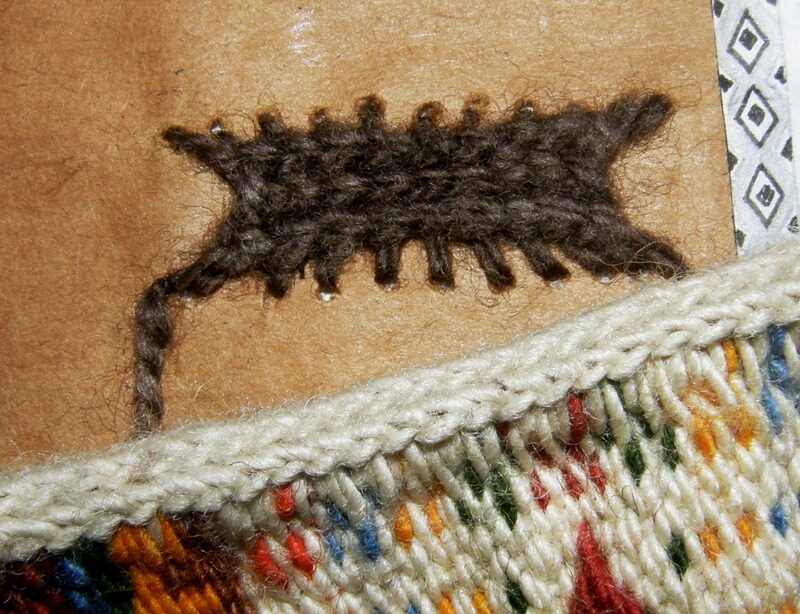 I would love to hear more about the stitching an joining for the bags. That would be wonderful! Your Abba Yohanni set is coming out so beautifully. Is just the middle motif section double weave? Thanks.Yes, just the middle section is double weave. The outer black bands are just normal warp faced plain weave. The instructions for combining strips of double weave with plain weave are in the group at Weavolution. It is the intermediate level tutorial and uses two wefts. You can’t really weave a large plain area in double weave as it is the motif that joins the two layers together. If there is no motif you end up with two separate layers just joined at the edges- somewhat like weaving a hollow tube. I will definitely do more on the bag joining and finishing techniques. Those braids and bands are fun! Thanks once again for lovely, wonderful, and informative videos, pictures, and descriptions! I look forward to your posts in a crazy way – they totally make my day, and get me fired up to weave! To that end, I bought a variety of dowels, and more 1″ dowel last night, so I can warp several projects this weekend and weave at me leisure (since warping seems to be the most problematic, time-wise, part of the weaving for me. Good idea! I like to get all the gear ready, get into warping mode and go for it. Then I have a nice stash of warps ready to roll in my closet. That knit edging looks like applied i-cord. I’ll have to try it out on the messed-up finish of the bottle cover I wove last summer! Laverne, watching your wonderful videos and reading about your experience with local weavers is such a treat! I mostly weave double weave on my multishaft loom but I love and appreciate the weaving methods and beauty of backstrap weaving. Hi there! I’ve never actually seen this type of weaving before. It’s very beautiful. And, it looks like it doesn’t cost much to get started. I’ll have to try this. TABIEN EL TE DE HOJAS DE COCA ES DIGESTIVO, PARA TUS PROBLEMAS ESTOMACALES, LETICIA DE MENDOZA , ARGENTINA.